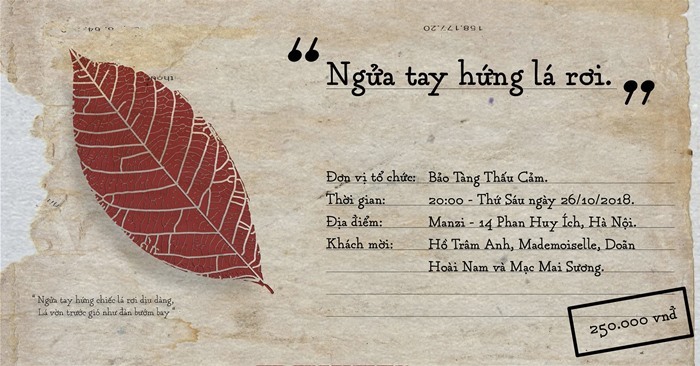 You are invited to the music night “Ngua tay hung chiec la roi” (Catching the fallen leaves) with the participation of guest performers Ho Tram Anh, Mademoiselle, Doan Hoai Nam, Mac Mai Suong. “Ngua tay hung chiec la roi” is like a chance to embrace and treasure the little things in life; to say goodbye to the passing autumn. We hope that this little, intimate stories told through music in the cool autumn evening air will touch your soul. How to purchase: You can get your ticket directly at HUB Cafe – 122 O Cho Dua or book it online by messagingBao Tang Thau Cam fanpage. Follow updates on the event pages. Discussion: "Bronze Drums of Southeast Asia"